The OMRON sensor (at least the D6T-44L-06 4 x 4 pixels, that I’ve tested so far) has a better measurement range in practice than ‘specified’ (note they say ‘detection range’ in the datasheet). I’ve successfully tested it from (-5 to 100 C). May even go lower than -5 C, but certainly not higher than 100 C.
That’s usually way specs in datasheet are written, so essentially all bets are off as far as the manufacturer is concerned. It is fine for a one off or if you screen the parts individually or large enough statistical sample from a production lot. Don’t rely on the performance (as in linearity, accuracy, noise level etc) of a part operating outside of its tested/designed range. No, in this case I don’t think it’s a matter of individual characteristics of the part as much as it’s a matter of the purpose intended by the manufacturer (people detection) and the range that it is calibrated for. For that range the performance is as specified by the datasheet. As the most usual applications for a thermal imager roughly fall within this specified range (5-50*C), I find it suitable. On top of that, an extended range in which temperatures are not measured with the same accuracy but still measured within what’s considered an acceptable error, I can live with that and it’s still useful. Yeah, this sensor is meant for people tracking/detection, as the datasheet says: “High Sensitivity Enables Detection of Stationary Human Presence” but i still think it is a cool project. I am actually waiting to get hyper spectral imaging in smartphones. Can you imagine the possibilities for instagram filters ? two 4×4 sensors should give you instant 9×9. Very interested in getting a fully made 16×16 setup for my tablet. It does beg the question though, how long until phones/tablets have a 16×16 thermal sensor built into them? Hijack is damn nifty, but don’t you get USB OTG in pretty much every tablet/smartphone? I don’t understand pinching pennies that hard on the device connection for a ~100 dollar gadget, unless I’m wrong about the USB prevalence and bluetooth really is the only other choice. Personally I wouldn’t want a USB-OTG connection because I might want to have the device charging or communicating with other peripherals while using it. Odd that bluetooth represents such a large cost increase, though. I wondered that, too, but if you consider the battery you’d suddenly need and its supporting components, that could add up. USB otg supports charging at the same time, if the device is made smart enough. I am wondering why OTG for android and audio jack for apple? Why not audio jack for both? Implementing the same audio-solution for Android phones would be a major hurdle, mostly because of the variance in audio circuits used for headphones driving. Some phones will simply deliver insufficient driving voltage or current for my hardware to work. USB for Android is a safer bet for device compatibility. Take a look at NXP’S AN11552 “Smartphone Quick-Jack Solution” datasheet , chapter 8.1 and it explains that the vast diversity of hardware that runs android is so different , drivers and all that it is difficult to ensure that apps will work on all devices, especially using low level I/O and re-purposing the phone’s hardware. I would of pasted the whole explanation why their product can’t be guaranteed to work on androids, but their datasheet does not want to paste properly and I’m not too lazy to reformat it. Thanks, I just had a look. I guess it makes more sense to use OTG, I think it is one of the great things about mobile phones. It would be interesting if some sort of standard of communication over the headphone jack would develop, but I suspect it is not that much interest in it due to the low cost of the USB. As far as iOS devices are concerned, it has to do with the licensing costs and royalties (Apple MFi program) of getting an accessory officially supported (app. in App Store). The only ways to dodge that (at this point) is either audio comm. or BLE. For Android, PC there will be an USB connection. now, the sensor this article is about may be a lot more sensitive, but it would be good to get a comparison. That’s NIR, not thermal IR. “Infrared” is actually an awful big swath of the spectrum. http://en.wikipedia.org/wiki/Infrared says 700nm to 1mm. Compare that to the range we can see, 300nm to 700nm. The IR you get from the LEDs in remote controls and the Wii’s “sensor” bar is 900-1,000nm, something like that. The IR you’re interested in for thermal imaging is more like 8,000-15,000nm, not even in the ballpark. I think you actually need exotic lens materials to handle that, not just an exotic sensor. The problem with this project and the similar ones before it is that the resolution is so limited, making the device pretty much useless. Personally I’ll wait for the Flir One. High resolution and fairly reasonable price. Have they actually made any progress on the Flir One? seems like its just hot air. Just ordered my Flir One this week. They said I should have it Aug 8. Is it still only for Apple devices? :-( whats the price ? DeWalt has a thermal imager that has pretty much the same resolution thermal sensor (heavily upscaled of course). Does Flir give the number of sensor sites for the Flir One? I couldn’t find it. It looks interesting, but for 3D printing, I can’t be limited to 100˚C. I believe it is 80×80 resolution. 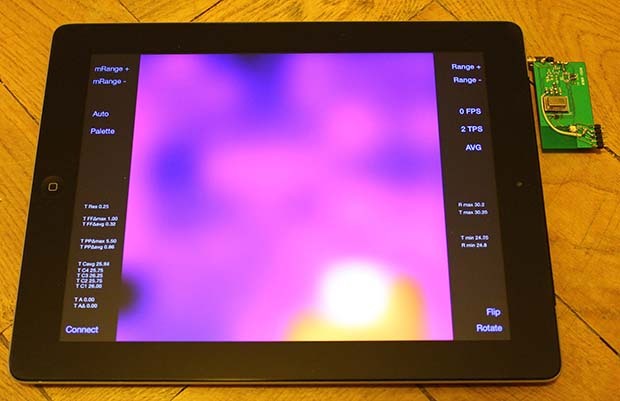 The resolution of the Flir Lepton ‘Camera Module’ (as Flir calls it) used inside Flir One is 80 x 60, but they use a clever SuperResolution algorithm to bring it up to 160 x 120. Search for Flir Patents on Lepton. Thanks for the link. That answers one big question I had, how do they handle ITAR, and it is the low frame rate.I have several other cameras, DRS and FLIR that are up to 640×480 and definitely fall under ITAR. Very cool. Nice to see more projects in the thermal imaging space. Problem is – as always – sensor resolution/price and integrating the components into a usable device. I have done a much simpler project with mechanical scanning (very slow, but reasonable resolution!) and a Raspberry Pi (Works as WiFi Hotspot/Server). The thing with a Raspberry Pi is that you can easily generate nice looking images with python libraries and do the complete UI/image generation via an embedded Webserver over WiFi. Nice resolution. The mechanical scanning reminds me of laser projectors. Aluminum is reflective to thermal IR. You could buy or create some aluminum mirrors. They’ll be lighter than the sensor and you don’t have to stack the servos. That should make it faster without adding much cost. There’s at least one project, by Noah Feehan (AKA Hacker 7543), that uses the Panasonic Grid-Eye thermal sensor. The Hackaday.io site has more info on it. You do need to combine a regular cam image with the IR image for good results. But I get it’s early days. Also we need a PC version of such a thing since android and apple are just too damn nosy to use their products. And a PC is still easier to control. Leopard Imaging has a microbolometer solution significanty higher resolution for under $300…..google it.